Yes, that bouncy, jiggly, yummy orange JELL-O that grandma always made has gelatin in it. 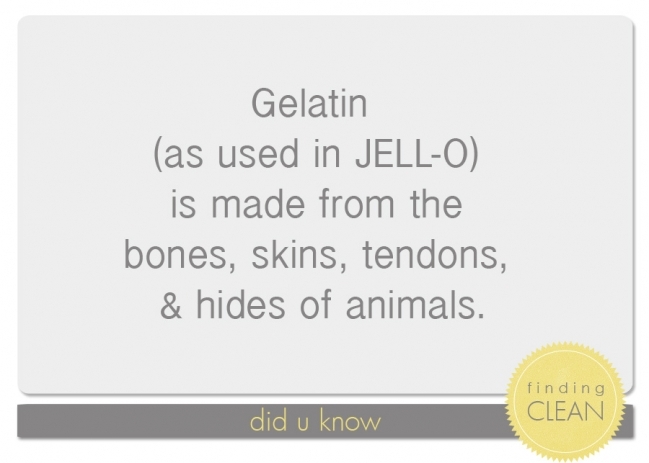 Gelatin is made through a process of grinding, heating, and breaking down the bones, tissue, tendons and hides of animals. This might be a little alarming to some people (that had no idea how it was made), but the collagen in gelatin is actually very good for our bodies. You can read more about it here and here. The problem with the store-bought JELL-O brand gelatin is the added food coloring, artificial flavors, and intense processing (creating free glutamates). For a healthier option, try Gelatin from only Grass Fed Cows such as this one from Great Lakes. It can also be used as a healthy protein powder, added to drinks and smoothies. I attempted to make my own fruit snacks and it was a failure. But, now that I have read the instructions again, I realized what I did wrong. I’ll keep you posted on my next attempt. In the meantime, here are a couple recipes using gelatin that are on my list to try.